Up to 100 mm diameter, flower stem to 100 mm. 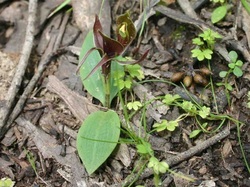 A single reddish brown flower to 40mm across. Naturally occurring plants in cool moist to dryish, shaded soil in forested areas.